A while ago, I wrote a brief note on a book called The Rocket Company, a fictional but technically accurate account of the development of a fully reusable two-stage launch vehicle. I really wanted to see this novel launch vehicle concept flying in Orbiter, so I enlisted the help of my friend Andy McSorley to do a proof-of-concept prototype for Orbiter. Our thought was to spread the word on the idea and then try to get some other add-on builders interested in doing a more complete implementation. Today Andy posted the DH-1 prototype as a work in progress at Orbit Hangar, and he announced it on the Orbiter forum, inviting others to download the working prototype, graphical meshes, and the developer's notes (my main contribution other than cheerleading and test flights). Andy did a nice job, and the concept works - you can launch straight up and fly the second stage to orbit, while the first stage returns to the launch site (more or less by falling now, eventually to a piloted hover landing). There seems to be some interest already, so we hope to see a more complete model of the DH-1 in the weeks to come. 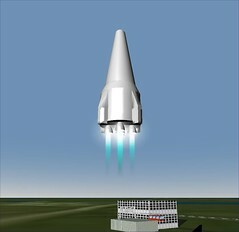 Rocket Company DH-1: Massive Overhaul!